With plenty of demand, why should you deserve to lose out? Parking in our cities is underpriced. I say this with confidence because so many people are willing to pay that there are never any spaces free. When it takes ten minutes of driving in circles to catch a vacant spot, any economist will tell you that there is no need to make parking cheaper – quite the reverse, if maximising the value of our parking estate is important (and it should be). Make no mistake, parking spaces are a public asset. We might allow local government to administer public land on our behalf, but in a very literal sense, you have a stake in a collective investment in parking infrastructure. Like any other investment, you should be keen to see it perform as well as it can. When large corporations take steps to legally minimise their tax bills there is public outrage: HM government is letting a huge amount of money rightfully owed to the state slip out of reach. There’s little sympathy for the idea that just because corporations don’t like paying tax that we should cut our own throats and make it cheaper for them. Imagine that local government across the country owned commercial property on a large scale. We would demand, and rightly so, that they let it at market rates when companies are lining up to pay, and didn’t give them discounts just because they’d prefer to make more profit. Parking infrastructure is extremely valuable – both in the sense that the land could be sold for fantastic sums, and in the sense that people are literally queuing around the block to pay the going rate to rent it out for an hour or two. Eric Pickles’ attempts to undermine the value of publicly-owned parking spaces are both ill-advised and frankly anti-Tory. If we allow these rents to be undermined by weakening enforcement or removing parking restrictions, it’s not as if it reduces the cost of living in the UK one iota. Instead, local government has to collect the money by raising rates and local taxes. Since when have the Conservatives been keen on *increasing* our taxes? 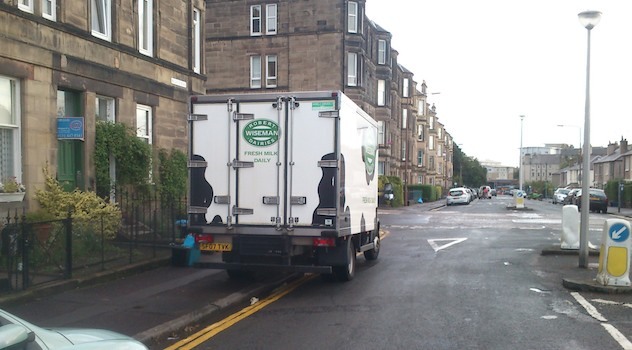 Barmy schemes like allowing people to ignore yellow lines if they feel like it are effectively redistributing wealth, something Tories are supposed to hate. Increases in council tax hit those who are better off that much harder, so Pickles isn’t even managing to get the poor to pay for the well off to park. 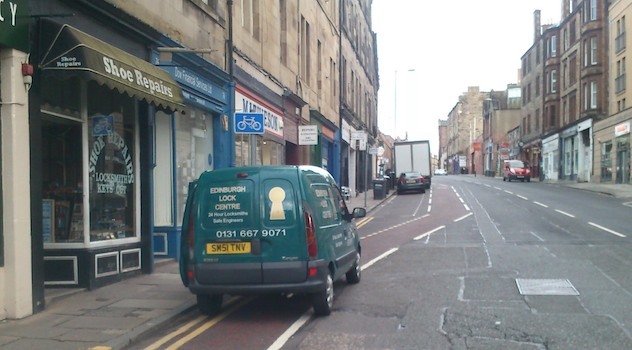 Parking on Edinburgh’s QBC is so brutally enforced that only four commercial vehicles were able to park for free on the single yellows in rush hour… how can businesses survive? In one recent financial year, City of Edinburgh Council made a healthy profit of almost £15m from administration of our shared parking estate. That’s a lot of money, and it all goes to reduce our council tax bill and business rates (unless you’d prefer to have bin collections and pothole repair crews cut to make up the balance). What, are you saying you’d rather pay for hundreds of nurses out of your own pocket than let councils fine people who park illegally? Of course, this isn’t literally true, because of the bizarre legislation that prevents councils actually charging free market rates and using the money to reduce public taxes. At the same time, it’s silly to argue that the money doesn’t impact other areas of the budget (if I gave you £100 of petrol vouchers it would allow you to spend £100 more on your mortgage – “ring fencing” in this sense is a bit of a false concept). The Tories are supposed to oppose big government. Why are they so enthusiastic about putting up rates and council tax with this drive to cripple councils’ ability to get a good return on the public’s property portfolio? Pickles actually went so far as to say, proudly, that he explicitly wants to force councils to raise taxes (or slash services) instead of “raking in pretty large sums of money” by renting out parking spaces at fair market rates. The latest target of Pickles’ ire are CCTV cameras which have been successfully used to reduce the cost of parking enforcement across the country. That is to say, the money raised from parking spaces we collectively own as taxpayers has increased, further reducing the taxes we pay. 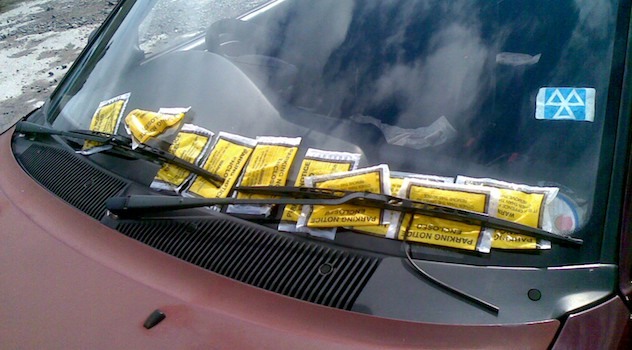 Apparently this is “over-zealous and unfair”, and instead of a few cheap cameras (that never lie) we are to be saddled with paying for a hoard of physical traffic wardens instead. (Although ironically they can simply stand and video the streets, like a very expensive human stand-in for a camera pole). Go Eric! Apparently it’s actually part of our parking legislation that councils have to ring-fence funds raised for certain purposes and can’t charge true market rates. Instead council tax and rates payers subsidise artificially *low* parking charges for everyone else. 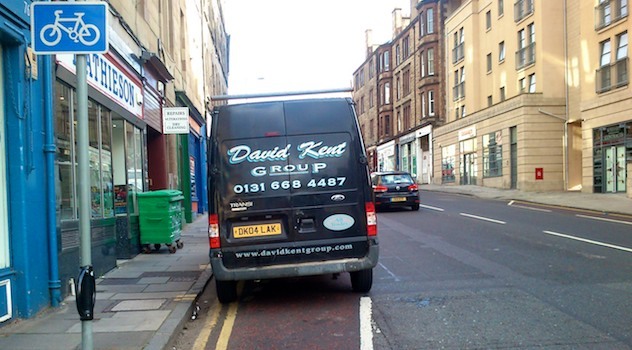 Just look at parking permits – as little as £50 will get you a year’s exclusive use of a space in an Edinburgh street that has a market value (even at current subsidised prices) of hundreds of times that much. Parking can’t simultaneously be too expensive and yet people will bite your hand off for the chance to park in the space you’re vacating. We desperately need to get away from this weird idea that increasing subsidies on parking spaces will somehow save local business / the high street / be fairer on the public at large. As we’ve discussed in other posts, fewer than 50% of residents in Leith even own a car, yet businesses on Leith Walk seem loath to allow even a limited reduction in parking spaces in exchange for an upgrade that would make the street pedestrian and cycle friendly and vastly increase footfall. But think about it. At the moment, business rates are kept artificially high because businesses are effectively subsidising cheap parking for their customers. 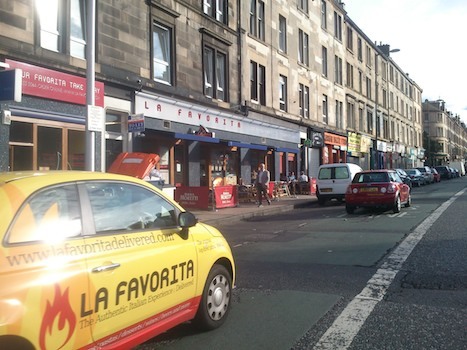 It doesn’t reduce trading because parking spaces and virtually always full – in fact, on Leith Walk it’s almost always double-parked. So if parking becomes even cheaper because of poor enforcement and relaxing the rules, it’s not as if extra customers can park in these magical spaces – they were already completely full. Instead, it’s a simple matter of less money being made, and rates payers (along with taxpayers) picking up the shortfall. Cyclists are impacted by illegal parking in another sense than the financial, and that is in our personal safety. 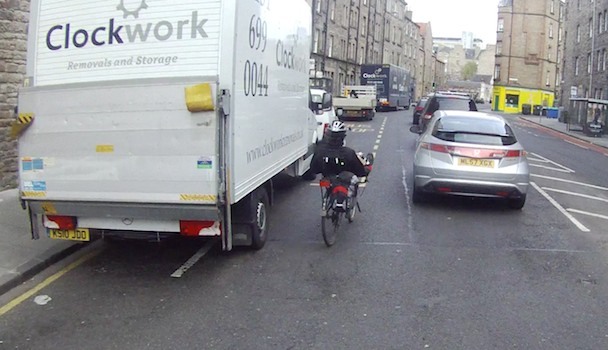 You only have to attempt to cycle on the council’s rediculous Quality Bike Corridor (with 40-50 vehicles parked in it at a time) to realise that the problem is not that parking is over-enforced or over-priced. Quite the reverse, a camera or two permanently mounted on Ratcliffe Terrace might actually make the Quality Bike Corridor a better quality place to be. If we liked cycling there, it might stop us driving to the out-of-town retail park where we actually do our shopping!